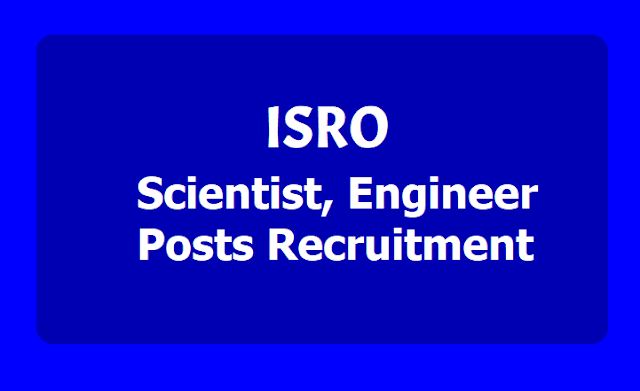 ISRO Scientist, Engineer Recruitment 2019, Apply online till January 15: Indian Space Research Organization (ISRO) released a recruitment notification for the positions of scientists and engineers in 'SC' or 'Stipendiary cadre' level. The ISRO has notified the jobs for graduates from the disciplines of Civil, Electrical, Refrigeration and Air Conditioning, and Architecture. Candidates who are going to complete courses this academic year are also eligible to apply, provided final degree is available by August 2019 and their aggregate is 65% marks or CGPA 6.84/10 (average of all semesters for which results are available), said the notification from the space agency. READ | How to Apply for ISRO Recruitment. Candidates may visit the official ISRO website at isro.gov.in to register their applications online in this period. Applications will be received online only. Scanned copies of latest passport sized Photograph and Signature of the candidates in the prescribed file size is required to be uploaded in the application. Upon registration, applicants will be provided with an online registration number, which should be carefully preserved for future reference. Email ID of the applicant will have to be given in the application compulsorily. "The candidates registered under National Career Services (NCS) portal and fulfilling the eligibility conditions may visit ISRO website and follow the application procedure as stated," said the notification. Candidates may make the payment 'online' using Internet Banking/Debit Card or 'Offline' by visiting nearest SBI Branch. Candidates after submitting their application can pay application fee immediately or any day before the last date for fee payment January 16, 2019. "The last date for submitting online application is 15.01.2019. Candidates are, however, advised to make online payment by 12.01.2019 to avoid any unexpected transaction failures/issues," the notification said. BE/B.Tech or equivalent in First Class with an aggregate minimum of 65% (average of all semesters for which results are available). Candidates who are slated to complete the BE/B.Tech course in the academic year 2018-19 are also eligible to apply provided final Degree is available. Age limit: Candidates age limit should have 35 years. Application Fee: There will be an Application Fee of Rs.100 for each application. Based on the performance in the Written Test, candidates will be short-listed for interview. The application for on-line registration will be hosted on the ISRO web-site between 26.12.2018 and 16.01.2019. Candidates may visit our web-site at www.isro.gov.in to register their applications on-line between 26.12.2018 and 16.01.2019. Applications will be received on-line only. Upon registration, applicants will be provided with an on-line Registration Number, which should be carefully preserved for future reference. E-mail ID of the applicant will have to be given in the application CORRECTLY and compulsorily. The on-line application has to be invariably followed up with a `No Objection Certificate’ from the employer concerned, by those already in employment under Central/State Government, Public Sector Undertakings or Autonomous Bodies, duly indicating the name and Reg. No. on the reverse. About : Indian Space Research Organisation (ISRO) is a Research and Development organisation engaged in application of Space Science and Technology for the benefit of society at large and for serving the nation by achieving self-reliance and developing capacity to design and build Launch Vehicles and Communication/Remote Sensing Satellites and thereafter launch them. ISRO strives to serve the nation in the areas of television broadcast, telecommunication, meteorological application and in management of our natural resources. The Indian space programme continues to pursue successful goals on all fronts in meeting the objective of achieving self-reliance in space technology and its applications for national development.